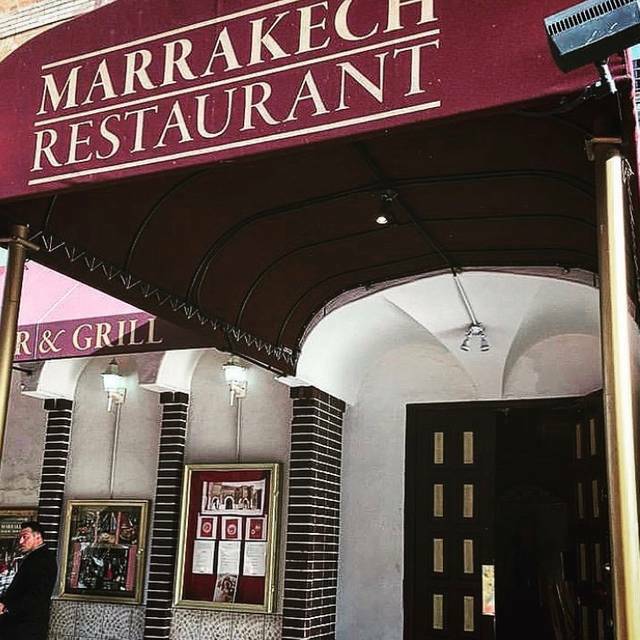 You must make reservations at least 5 minutes in advance of the time at Marrakech Moroccan Restaurant. Two Parking garages on the same block. Toca Park in Shannon alley, California Parking garage half a block down. 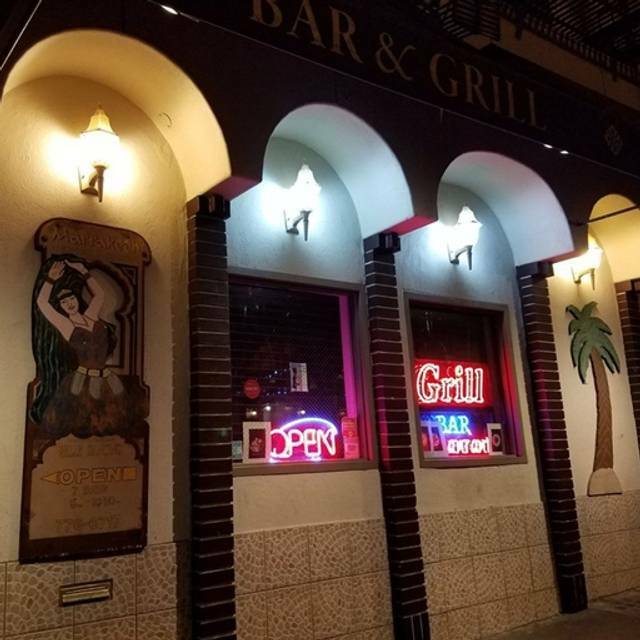 We are five minutes walking Distance From Powell Street Bart Station. Taxi accessible. 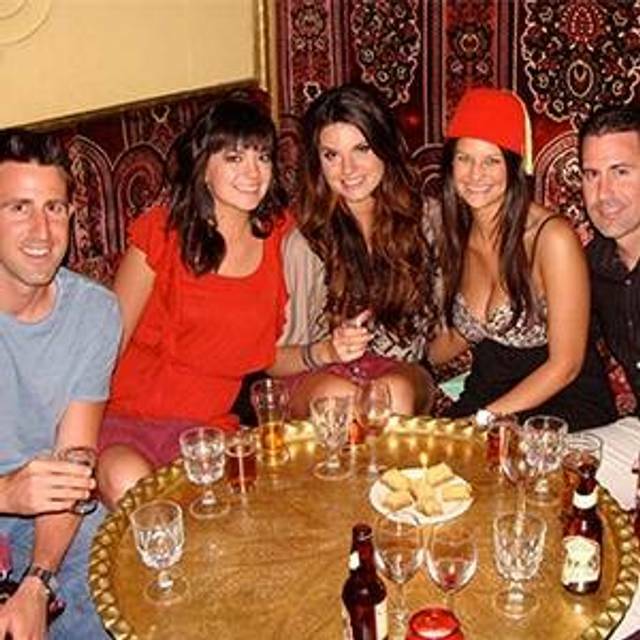 Marrakech Moroccan Restaurant in San Francisco features beautiful belly dancing shows every night, accompanied by live music every Saturday and First Sunday of every month. Moroccan and Mediterranean cuisine available for catering. Includes homemade Moroccan bread, hummus, shish-kabob, braised Lamb and chicken with couscous and stewed vegetables. We provide catering to businesses around San Francisco. Elegant Moroccan Interior, low cushioned seating(regular seating available). Tradition Moroccan Family Style, large banquet plates served onto smaller plates. Private Live music entertainment and Belly Dancers upon request. 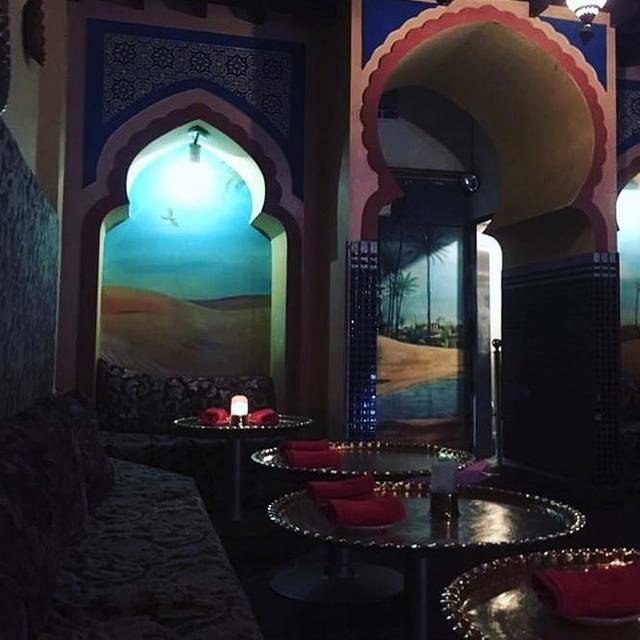 This is one of the first original Moroccan Restaurants in California. It's worth the trip alone. This princely feast is furnished with low couches and large decorative pillows. The rooms are softened by tapestries covering the walls and ceilings. The decor creates an atmosphere of comfort and leisure. The meal is a feast served with home baked bread. This is more than just a meal; you can give over an entire evening to this relaxed and unique dining experience. 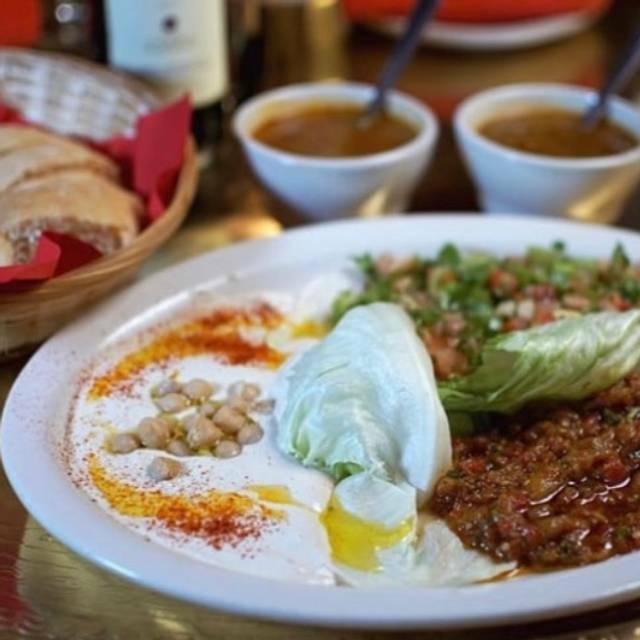 Your full meal at Marrakech includes delicious Maghreb Salad, Harira (lentil soup), Bastilla (an amazing pastry-like dish, vegetarian or chicken), your choice of exquisite Moroccan entrees, freshly brewed sweetened mint tea, and baklawa (Moroccan pastry). 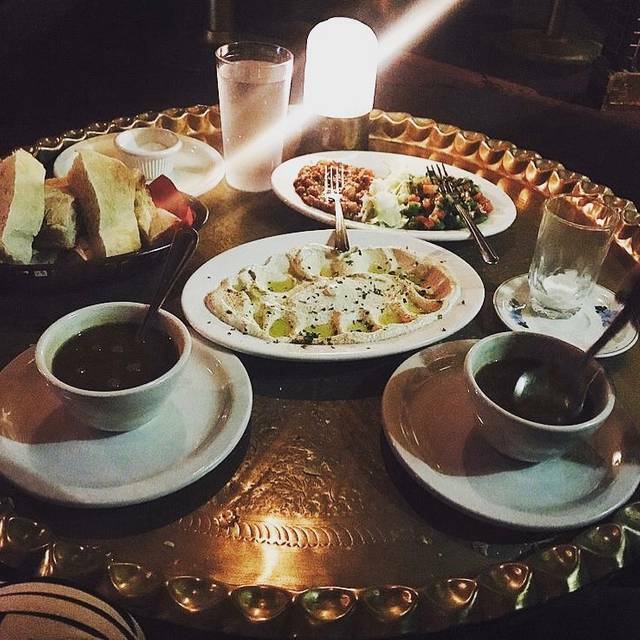 Your Moroccan meal is best eaten Moroccan style -- using delicious, freshly baked bread as the ideal all-purpose eating utensil. 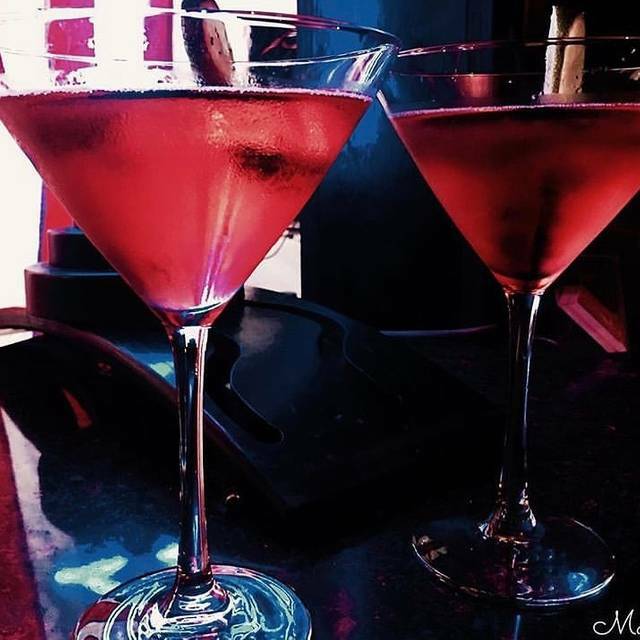 To enhance your meal, we offer a wide selection of imported and domestic wine and beer, as well as a full bar. This is my favorite "hidden" spot. Food comes out slow, but I LOVE THIS PLACE, washing the hands, amazing food, belly dancers, hookah, ambiance, LOVE IT! Delicious food. Graciously served. Wish we lived closer. Amazing Experience, great food and ambiance. Worth visiting again. Wonderful place, especially for something "different." Yummy food (we had lamb tagine, chicken kebab, lamb with honey and almonds) and dinner option is worth it, comes with: soft fresh white bread; 3-appetizer plate (although one is just lettuce); bastila--a flavorful sweet chicken all the mint/honey tea you can drink, and baklava for dessert. Allergy note: many dishes have nuts (almonds or pistachios or walnuts); almost no seafood except one dish with prawns. And wonderful ambiance: soft colored lights, no kitchen sounds, muted-colorful fabrics and patterns everywhere, friendly service from servers with limited English. Around 8:00 pm belly dancer started, wonderful (tradition is to give her cash which she tucks into her costume). All tasteful and completely fine for a family; we had 3 teens who loved it all including the food, and another family with a very young child was there too. At same time, romantic setting for the couples. We all enjoyed warm water poured over our hands occasionally, and the skill of the server who poured our tea from a spout held about 30" high above the cup. We'll for sure be back. Hint: if you have the time, *definitely* go to the magic show with Jay Alexander downstairs after or before dinner--you'll laugh out loud and be amazed. Huge hit with teens! We went here for a friend's birthday. The food was amazing. Our waitress was knowledgeable about the food and lead us through a great meal. Definitely a new favorite. We had a pretty awful evening on Christmas night! I had reserved ahead via OpenTable, and we (me, my wife and daughter) showed up 15 minutes early - ahead of our 8:00 pm reservation. The guy at the door said he didn't have our reservation on his list. I showed him the OpenTable confirmation - he went inside to check and came out and said they didn't have our reservation, so asked us to go to the basement - back up dining area. I told him that I had booked ahead and wanted to be on the main floor - not in the basement - because I had read reviews that the basement is pretty awful. He said that the main floor was for large groups - not for three people - a complete lie. I asked - before going down - whether the dancers will be also available in the basement, otherwise, we would go to another restaurant. He said, "Oh absolutely - the dancers will be downstairs also". DANCERS NEVER SHOWED UP. My 12 year old daughter was utterly disappointed - we went to this place for Christmas Day dinner not just for food, but for ambiance also. And, it was a total waste. But wait - there is more ... They had around 12 different tables in a very ordinary room - looked like a dungeon. There were ONLY one exit - HUGE FIRE HAZARD issue. I didn't notice it but my kid did when she went to the restroom - came back and said there was only one exit. Food was exceptionally ordinary. Drink menu limited, and they had ONE WAITER to support 12 tables - service was awful. I went outside and up once during the dinner, and heard that the dancers were on the main floor, which wasn't fully occupied either. I was really upset when I saw that ... My wife asked me not to cause any issues because it was a Christmas night. We quietly had our lousy dinner and left. And then - this morning OpenTable contacted me informing that the restaurant called to complain that we didn't show up. Well guess what I have my credit card receipt to show we did. Overall, a very enjoyable experience. Food was tasty. Recommend the hummus appetizer and shrimp kabobs. Large portions and the belly dancer/entertainment helped create a festive atmosphere. Very sketchy restaurant with spotty service, worn, threadbare decor, and mediocre food. First I can say that the food here was excellent, and IMO a good value. However, the service was not good, almost comically bad. We tried to overlook that and enjoy ourselves. Maybe it was an off night because of the holidays, but I couldn't recommend this restaurant despite the fact that the food was very very good. Everything was perfect. My friend and I each ordered the 5 course meal. It started with a delicious cup of lentil soup with plenty of warm bread. This was followed by a plate of two appetizers—one of which was an eggplant spread. Really tasty! Then a beautiful Bastilla, a powdered-sugar dusted flaky pastry with a ground meat filling. That was quite a treat. Next came the entrees. I had a Lamb Tajine. It was a very generous portion and the lamb was extra tender. Just a great entree. I was able to finish my entree but my friend needed a To-go box. For desert we were served a small piece of Baklava which was a perfect way to end the night. Great service, meal, and atmosphere! The staff couldn’t find my reservation at first but still seated me and my date. It was the perfect atmosphere for a holiday and they were so kind as to make sure my date got their card that was mistakenly left. The food was excellent and traditional. Be nice to have some aroma therapy burning to contrivute to a more authentic atmosphere. Great birthday party, friendly manager and very nice service. The only things that are not ideal are: drinks to be bought by ourselves at their bar, with a separate bill, and music too loud even far from the stage. Thank you once for making my party of 26 fit so comfortablity. The staff went Above and Beyond it’s expectation. This was my second time with a big party at the venue and once again they were amazing. Thank you for making my birthday the best birthday ever. We had a really last minute friend’s wedding dinner at the restaurant. I booked 50min before the reservation time. The food, the staff were very good. Also, we had an access music and were able to have a little wedding dancing party as well. Thank You! This place is terrible. It is nothing like the reviews we read. Don’t understand how open table can give this place 4 stars. The only thing worse then the food and service is the neighborhood around the restaurant. Stay away. Fun night but a little pricey for the quality of food. The food was very bland, not much flavor. The ambiance and belly dancer were great. The food was incredible and the service was above and beyond. Will go again when I’m in SF again. The food was good, but very slow to arrive. We only had 20 minutes to eat before we had to leave for our 8 pm theater show. They do have an 8 pm belly dance show, which we were unaware of when we booked. I would allow 2 hours to have dinner here. I been there couple times but this is the first time I had to pay a cover $10 I or we had dinner not only drinks, but wherever I understand that on the late night people just go for drinks but for our case we made a reservation because wanted to have dinner and plus enjoy the music. I wonder if they have the cover any time or just late night? We took my friends who were in town from Europe there, the restaurant triple charged us on everything - we ate two veggie plates, had 3 bottles of wine and had 2 hookahs and they charged us $350. Biggest SCAM and RIP OFF, feel very taken advantage and do not recommend the place at all. Dirty, old and musty. The belly dancer was cute, the food very average. Food was average but the entertainment (belly dancing) was great! The food was amazing, ambiance was wonderful, and the wine options were lovely. I felt like I was in Morocco with the ambiance, music, and great bellydancing. This will be a memorable night! This place was fun & tasty, but could be so much more. The service was slow & disorganized. Plus, the restaurant smells weird (stale & musty). A good cleaning & airing out could do wonders. 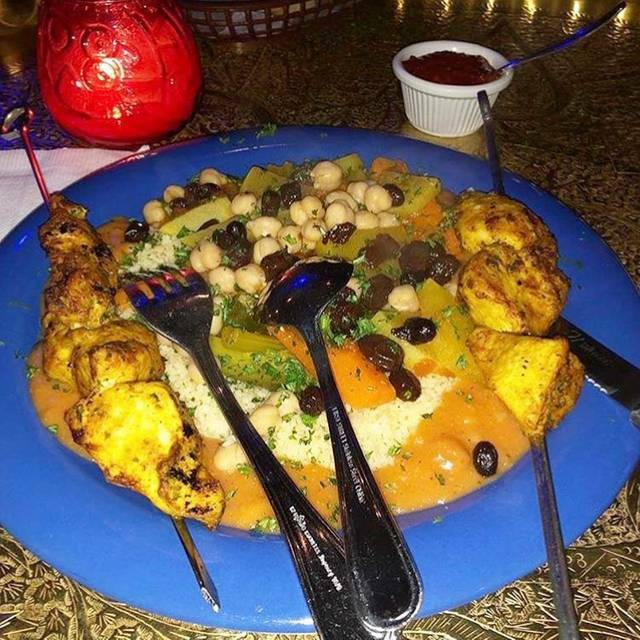 I love Moroccan cuisine, but here the Food was good but not great. We came here for our anniversary. We were very impressed with the service. The food was excellent. We also really liked the drink selection. One of the best things about the evening was that we saw a magic show one level below us in the same building that ended just in time for our dinner reservation. The show was terrific! The evening ended with Dessert and a surprise candle for our anniversary. It was totally unexpected. You can do better! This was the worst customer service I've experienced in a long time. I brought my husband to this restaurant for his birthday dinner and frankly I probably should've just bought him some snacks at a local gas station... it was that bad. The staff was unfriendly and rude. The menu was not properly explained (we went with the dinner special) and we observed that several other tables that came after us were served and settled well before us. People that came in after us left before us! They didn't serve bread at the table, even though several different waiters walked by and asked us about it. It wasn't until the host asked a nearby waitress to get us bread to which she complained loudly for all to hear, "Well I was going to give this bread to another table. What do you want me to do?" And then she plopped the plate down on our table hard. Did the restaurant have a bread shortage or were people just refusing to do their jobs!? The couscous royale was mediocre at best, it was good but not great, just passible. Dessert was part of the special and the waitress refused to give us a dessert and kept saying that the tea was the dessert. Another waiter walked by and asked us if we had received our desserts to which I said no and he promptly brought over two "fun size" baklava pieces. (I mean, did that waitress seriously have to argue with me, the customer, about baklava pieces that are smaller than a pinky finger??!!) I had to ask for the check 4 times and they didn't even bother marking us as attendants on open table, until I wrote back to open table and explained we were unfortunately there. This is also why I'm writing this review. I give everyone 4-5 stars so for me to give such a low rating... eat here at your own risk. The place needs a major makeover as it looks very run down, the food is mediocre, and the customer service is lacking. DO NOT EAT HERE unless you like wasting time and money. Took a long time until the food was served. And they brought out the appetizer 20 min after the main course. Really??? I make the drive periodically for the tenderest lamb dishes, the live music, and the belly dance entertainment. 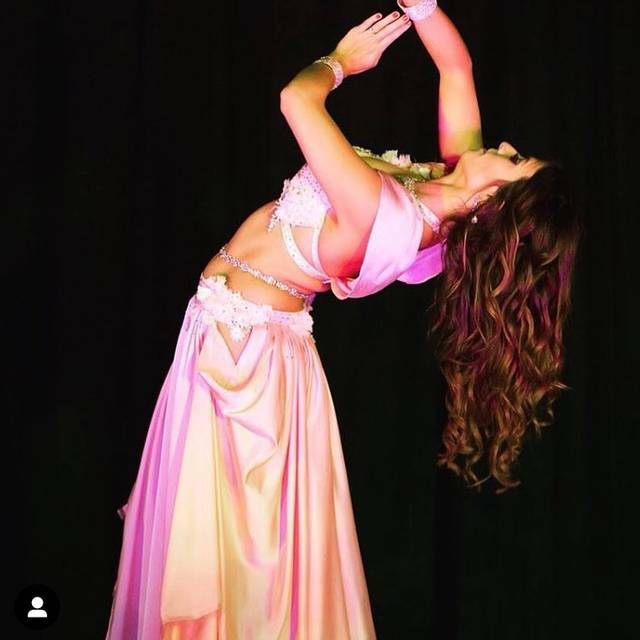 *Disclosure* I am acquainted with many of the performers, and enjoy the artistry and skill of both the phenomenal house dancer and the guest dancers. This time Christina's set blew me away. Her engagement with the customers was magic, and a pleasure to observe... Thank you for having live music and Dancers' Night! If only the service was as good as my chicken with eggplant. Basically, there is very limited wait service; no water, linens, silverware, 40 wait for wine. Carpets and wall hangings are very dark and don’t appear very clean. The place is so dark that walking is a bit hazardous where the floor is uneven. Service fell short, and then so did the food... One of our skewers [chicken] was not prepared properly, and between the additional charges and the rudeness of the girl that was serving us, there was much left to be desired. There was a belly dancing show that was pretty good, but not very authentic.